A printable concept book for children to learn the names of animals and their offspring and become authors and illustrators of their own little books. Ideal to use in literacy group rotations or as an independent task when learning to read and write. Children write the name of the offspring, then draw their own picture. Choose to use either the black and white or colour version. Provide the children with their own copy for them to write the name of each offspring and draw a picture to match. Use the answers page provided to check if they have named each offspring correctly. 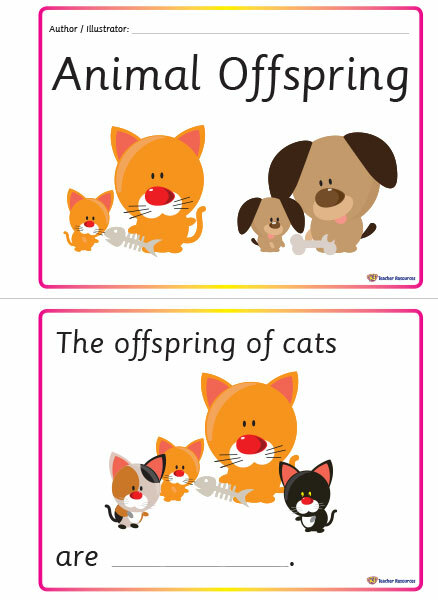 What would come next – Use the blank pages for the children to create their own offspring sentences.